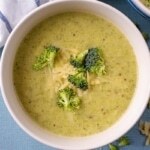 The creaminess of this Creamy Broccoli Soup will make it feel much more indulgent than it actually is. Heat some oil in a large pan and cook the onion and potato for 3 minutes. Add the stock, mustard and salt and pepper and simmer for 2 minutes. Add the milk and the broccoli and cook for 10 minutes. Blend until smooth, then stir in the grated cheese. 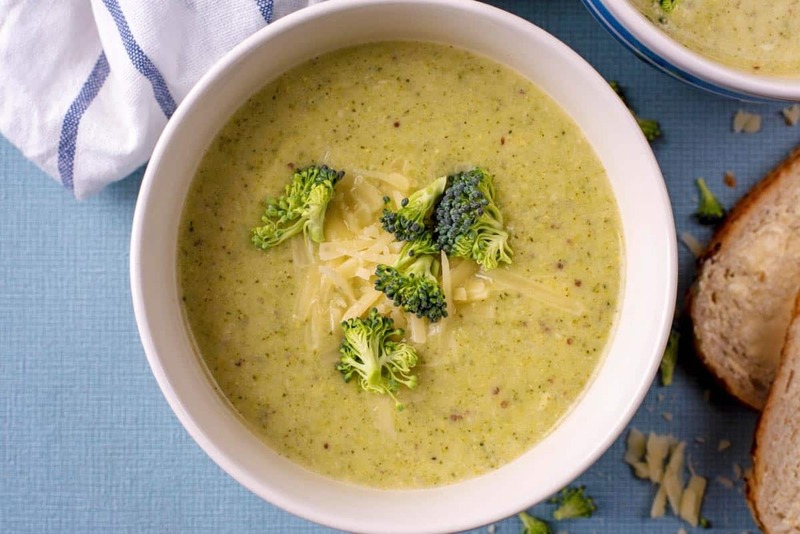 Pour into bowls and top with more grated cheddar and some raw broccoli (both optional). You could add some cauliflower too to use a mixture of vegetables. Prefer a stronger flavour? Use stilton instead of mature cheddar. If you are making this for young kids, mix some little bits of pasta in to it, to make more of a pasta soup stew. You could make this vegan by using almond/soya milk and vegan cheese. Try using shallots instead of onions for a sweeter flavour. Top with some toasted seeds to add some crunch.